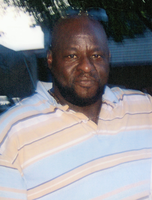 Provide comfort for the family of Ernest Shell with a meaningful gesture of sympathy. Mr. Ernest Shell, 60, of Greenville, South Carolina, was born on February 25, 1959, and departed this life on Thursday, February 28, 2019, at McCall Hospice House. He was the son of Annie Bell Miller Richey and the late Willie B. Shell. He attended Benedict College and was the owner and operator of Greentree Trucking Company. He was a member of Tabernacle Baptist Church where he sang in the Contemporary Choir. Ernest loved driving big rigs and collecting guns. He was preceded in death by his father and his brother, Willie Lewis Shell. Left to cherish many fond and loving memories are his mother, Annie Bell Miller Richey of Easley; his fiancée, Charlie Mae Gordon of Greenville; two stepdaughters, Regna Gordon (Tim) Walker of Taylors, and Darlene Gordon of Gray Court; one stepson, Eddie Eugene Copeland of Greenville; and a host of other relatives and friends. Peace & Blessings to the family. Tabernacle Bapt Church family will miss his jokes and laughter. May God grant you strength to move forward in your time of bereavement. My name is Dee Elliott. I’m the dispatcher at Lightning Transportation. It was a pleasure working with Mr Shell. He would always keep us laughing in the office. You have my sincere and deepest condolences.